When last we left them, our two hedgehogs were on their intrepid way down to Puerto Madryn, on a quest to see penguins. And penguins they did indeed see there, among much else. But these are tales for another time. For the moment, it is enough to say that they had a wonderful time there and then booked their passage onward: an eleven-hour bus journey, clear across the breadth of the country, to a place in the mountains near Chile. A place called El Bolsón. There are basically only three things you need to know about what’s happening right now: we’ve met up with Paul and Caroline again, we’re staying in the loveliest little cottage, and we couldn’t be happier. It’s funny. We first met Paul and Caroline only one short month ago, on our second night in Buenos Aires. But somehow, when we met up with them again here, it felt like reuniting with old friends. They’ve been here in El Bolsón for two weeks now, trekking through the mountain ranges that surround us and staying at a local campsite/hostel. Once they had one look at the cottage we’ve rented, though (more on that in a moment), they immediately rented the one next door to us. They’d been planning on heading a thousands kilometers north today, to the mountains and wineries of Mendoza, but have put that off for a few days so we can have a little more time together. Last night we enjoyed together a thoroughly Argentinean dinner (i.e., enormous quantities of red meat and red wine), and planned the treks we’ll take when we visit them in England in August. About a fifteen-minute walk out of town, a gravel road leads steadily up into the mountains in the distance. Some ways up this road, nestled well back among the trees, is a collection of cottages. As soon as we saw one we knew that not only were we staying here, but that we might be staying in El Bolsón longer than we’d originally planned. The first thing you should know about this cottage is that the photo at the top of the entry is the view from the front window. 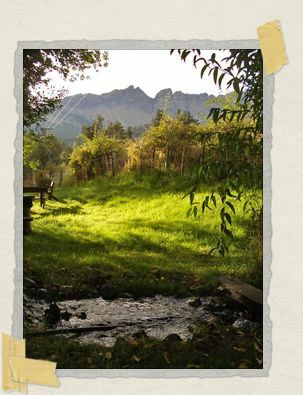 It’s in a spectacular setting, surrounded by mountains and forest and rolling hills. There are only five or six cottages on the whole property, and only two are currently occupied: one by us, and the other by Paul and Caroline. The cottage itself is wonderful, very reminiscent of the cottage my great-aunt and great-uncle have in Quebec. It’s made of wood and stone, with gas heaters in every room to keep it warm (it’s chilly up here right now). A beautiful wooden staircase leads up to the second-floor bedroom, and the kitchen has a door leading to our back yard. That yard, meanwhile, comes with wooden picnic table and benches, a barbecue grill, and a stone firepit. Dividing our yard from Caroline and Paul’s is a mountain brook, which you can hear gurgling from inside the cottage and which is so clean that you could drink it unfiltered if you wanted. And just what is the price of such extravagance? 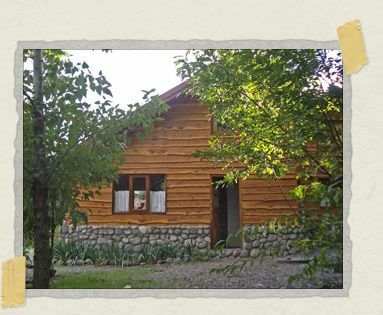 How much does it cost to have your own private cottage in the heart of the Argentinean Lake District, complete with a front deck and back yard? Well, the answer is pretty shocking. Sixty pesos a night. Bearing in mind that there are presently about 3 pesos to the dollar, that means that this isn’t even a splurge for us. This place, amazingly, comes in under budget. This morning, I made French toast for the two of us while she slept, which we ate topped with honey and washed down with some local herbal tea while watching the birds outside the kitchen window. Right now, the three of them are all doing a little shopping in town, and I’m sitting on the bench on our front porch, writing this while watching the owner’s adorable 6-week-old basset hound puppy chase a fluffy gray cat around a tree. Tonight, Paul is going to barbecue us up something spectacular (it bears repeating that he is a professionally-trained chef), and we’re going to watch the sun set over the mountains while drinking several bottles of Argentinean wine. Tomorrow morning I think I’ll wake her up to omelets and toast and coffee. 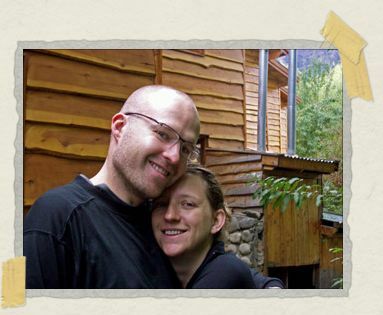 Caroline and Paul are heading up to Mendoza in a few days, and we might decide to join them. That would probably be for the best, because unlike Punta del Diablo, El Bolsón does have an ATM, so if we don’t leave with them, we might never leave at all. All of which is to say, don’t worry about us, folks. We’re doing fine. Wow sounds great! I was just passing through the site and caught the change! Ha! I got first for the first time, I rock! AMAZING! I am in awe right now. God. Gorgeous. Amazing. *wipes drool* You two. I'm inarticulate. So great. Wow. The meals sound fantastic, the scenery is unspeakably gorgeous. The writing, the times you're having, sound blissful and lovely – so what you deserve. The friends you've made sound amazing, too. Wow! I wish I could be like you two… fearless, laid back and full of adventure. However, my poor sense of direction has crippled me with fear to the point where I can no longer drive to new places by myself. The fear of getting lost is robbing me living an adventurous life, which is probably why I'm slightly envious of you two… for you have no fear. Lovely view! Sounds like you're having a great time. I thought of Tim today when I went into Hot Topic and they had a Squee shirt. Guess what I'm wearing now. You have inspired me to get big fat steaks, red wine and whip up a Chimichurri for tonight. I love love love this site. (And you guys too) and I'm so glad you're having such an amazing trip! Hey guys .. totally LOVING your trip so far and living WAY too vicariously via you! i've been at home sick for the past four days. please post an update of your fantabulous journey so i can live vicariously. did i mention that i've pulled me entire bed over to the computer so i can be fantastically lazy? We are still working off the lbs from those nights eating and drinking in El Bolson.